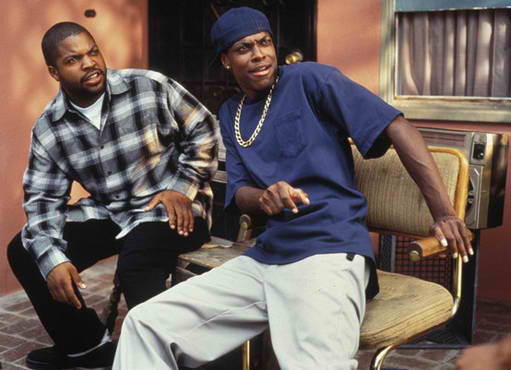 Ice Cube and Chris Tucker in "Friday"
The movie Friday is something of a classic. Not a classic in a Gone With the Wind sort of way, but a classic in a Roadhouse sort of way. The movie didn't win any awards, but is still a must see. Friday follows Craig (Ice Cube), who just got fired on his day off, and his buddy Smokey (Chris Tucker), through one Friday afternoon. Craig needs to find a J-O-B and Smokey thinks he should just get high and forget about it all. I readily admit, this isn't normally my type of film. But the ending is something that I think we need to go back to. Within the past week or so, there was a disturbance at the neighborhood McDonald's. A co-worker was in his car in line at the drive through, patiently waiting his turn, thoughts of "cheeseburger or double cheeseburger" occupying his thoughts when a kid comes zooming into the line on his bike. The boy was zig zagging between the cars pedaling as fast as he could in the snow and ice. He was being chased by three other boys on foot, in the middle of the afternoon, in the McDonald's parking lot, shooting at him. Shooting. With a gun. At him. In the McDonald's parking lot. As my co-worker told the story, I couldn't help but think of every action movie I had seen, the heroes making perfect shots at the bad guys, sometimes even holding back because of the crowd of innocent by-standers. On Friday, the same boy was chased by the same other boys just a further down the street. This time, the gun boys (I can't really refer to them as *gunmen*) were a little quicker and they caught up with him. Shot him 3 times in the parking lot. Which brings me back to the ending of the movie Friday. The short version is that Craig is tired of being chased and threatened by guys with guns. So he wants to settle it the old way. Throw down the guns and fight with your fists. I'm not condoning violence here and I certainly don't want to see anyone hurt, but when I was growing up, kids fought with their fists. Kids got beat up. There were times that the tables were turned on the bully. Kids fought back and the bully left them alone. These kids however, thought they were big and tough with their guns. Give me what I want or I'm going to shoot you. That isn't big. That isn't tough. That is the weak, cowardly way to get what you want. I want to go back to Friday.